22nd Eurasian Economic Summit has been started with the participation of Binali Yıldırım, the president of Grand National Assembly of Turkey. President of Marmara Group Foundation Dr. Akkan Suver which inaugurated the summit said that Eurasian Economic Summits have become a tradition. Azerbaijani President Ilham Aliyev, Montenegrin President Milo Dukanovic, President of the TRNC Mustafa Akıncı and Prime Minister of Bosnia and Herzegovina Denis Zvicdic sent message to the summit. President of the IHKİB Mustafa Gültepe which have speech in the opening of the summit, OSBÜK Chairman Memis separately gave strong Turkey message. President of the Marmara Group Foundation Dr. Akkan Suver specifying that they have carried out the summit for 22 years incessantly, said that the event becomes a tradition now. Dr. Suver whom expressed that the summit offers an opportunity for Turkey in terms of today's conditions, illustrated that this summit is a suitable platform for Turkey's struggle against terrorism to be told. Dr. Suver , mentioning Turkey's struggle against terrorism, also reported that it will not be allowed to be done the desired fait accompli at the the Black Sea and the Mediterranean. Stating that as a foundation they always defend the EU, Suver said they see the EU as a culture of stability, prosperity and peace. Speaker of the Grand National Assembly of Turkey Binali Yıldırım in his speech at the 22nd Eurasian Economic Summit said that: "The way to solve the problems of immigration and refugee in the world is not to build high walls, but it gets through eliminating the injustices of the world, maladministration and income distribution gap." 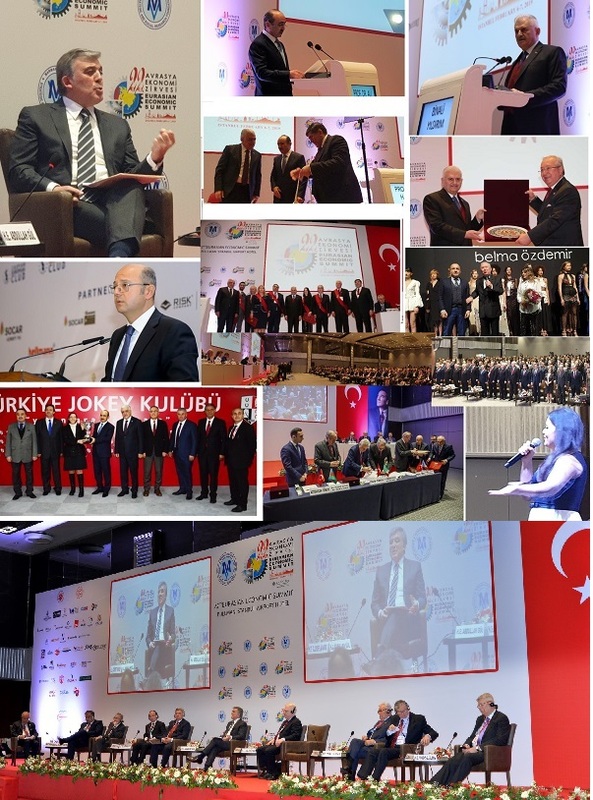 Speaker of the Grand National Assembly of Turkey Binali Yıldırım being in the first place, a large number of domestic and foreign guests joined the 22nd Eurasian Economic Summit. Yıldırım whom made a speech at the summit, while stating that all efforts are to bring peace and tranquility to the countries, said that " All these efforts are for bringing peace to our countries, our regions. Of course, it can be an advantage for the other regions of the world that the geography that we are in is associated with terror and violence. However, we have to approach these issues as solution-oriented"
In his speech, Yıldırım also touching upon the conflicts and wars in the region, said that " when there is a problem war and conflict should not come our minds firstly, at this point, it is necessary to deal with the issues that cause conflict between the countries of the region. If you pay attention the region which all kinds of terrorist confusion and dispute concentrated is again Eurasian region. In his speech at the 22nd Eurasian Economic Summit's session titled "Populism", President Abdullah Gül expressed that populism is a subject that is current and worrying in the world as well as much talked about. Stating that while populism is developing it's not only downgrades democracy but also weakens the basic principles and qualities of democracy, Gül said that "We all know that after the collapse of the Berlin Wall in 1989, after the collapse of the Cold War, after the Soviets collapsed in 1991, democracy and freedom began to spread over a wide range of people. People have began to benefit more from basic rights and freedoms. Under the rule of law principle, states were restructured. The constitutions were rewritten. When writing the constitutions, very important steps about how to be a democratic state of law were taken in this regard." Gül, whom indicated that however, in the second decade of the 21st century, things started to go back a bit and the populist movements were seen to rise in many parts of the world, said that while many developing countries struggled to raise their democratic standards and legal standards, they were suddenly starting to decline, while aiming at radical reforms.